If you have fallen away from your healthy eating habits and are in need of a community committed to getting back on track – you need to join us! 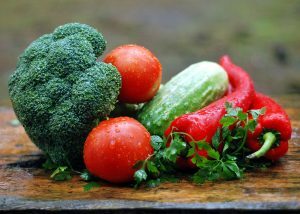 The 10 Day Nutrition Reboot will teach you how to eat real food which will give you more energy and a good-gut feeling. You will get a head start on kicking your sugar addiction and maybe even lose a few pounds. The goal of this program is to Reboot your nutrition habits. Get you back on track or introduce you to feeling better than you ever thought possible. Registration is easy: Click on the “Buy Now” button below. You will be directed to PayPal where you can use a credit card or your PayPal account balance. Upon completion of registration and payment, you will be placed in a private Facebook group and receive an email copy of the 10 Day Nutrition Reboot Healthy Eating Guide. You can participate from anywhere in the world! Yes. It will also be WORTH IT. Typically the hardest part is making the time to eat real food. Ironically, it is also the healthiest habit you will develop over the ten days. Learning to eat real food and avoid fake food, isn’t always easy. My expertise as a Master Certified Health Coach will guide you along the path to health and wellness. We are in this together! The 10 Day Nutrition Reboot Healthy Eating Guide. Upon registering you will receive a list of foods to stock in your home and what to avoid. These will be suggestions for success but not an inclusive or exclusive list. You will have 100% choice of over which healthy, real foods you put in your body. Daily inspiration and motivation from Coach Amy, a Board Certified Health Coach. Full access to Coach Amy during the program. Call, email or text me anytime – even from the grocery store! No products need to be purchased for success in this program. Only real food from your own, local grocery store! This is a $650 value for only $49! I want more energy and to ‘reboot’ my health through good nutrition. Sign me up! Excellent. 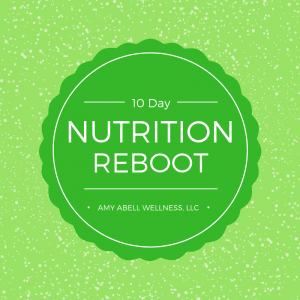 The 10 Day Nutrition Reboot will run through a private Facebook group. Upon completion of registration and payment, you will be placed in the group and receive an email copy of the 10 Day Nutrition Reboot Healthy Eating Guide. Please contact me with any additional questions prior to the start of the program. Complete the registration process now. Thank you. I can’t wait to join you on this journey!